Just to whet your appetite on what’s to come, here is my somewhat poor digishot of a Louisiana Waterthrush. 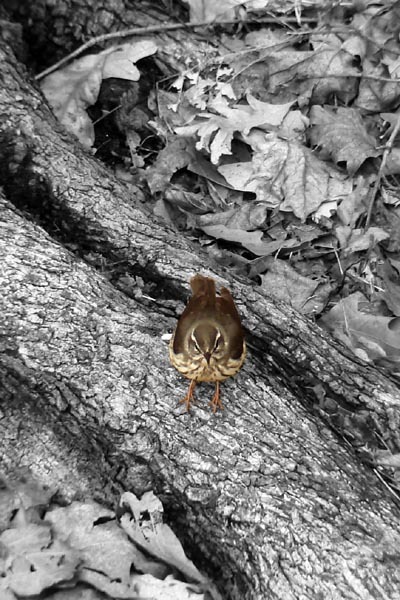 I thought that putting everything in b&w except for the warbler itself would jazz it up a bit. I know that there have been recent controversies about doctoring photos but you have to remember that this is not photojournalism, its closer to art. Anyway, this bird was neat, entertaining me on a less than exciting morning at the hawkwatch. He/she spent at least an hour, foraging in a flooded yard below the hawkwatch, pulling worms and other exciting food items out of the lawn. Unfortunately he did not sing, but that is something I will be able to hear most mornings this summer as I do my point counts for the PA Breeding Bird Atlas.